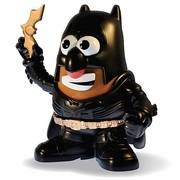 Batman Dark Knight Rises Dark Spud Mr. Potato Head requires attention! This is a LIMITED EDITION. Although the production numbers have not yet been released for Batman Mr. Potato Head, it is irrelevant. Mr. Potato Head Limited Editions always command extreme demand! The fact that this is a BATMAN Limited Edition Mr. Potato Head could be a generational rarity!Batman Dark Knight Rises Dark Spud Mr. Potato Head means villains and evildoers of Gotham City beware of the Dark Spud! Dark Spud stands approximately 6-inches tall and comes in a special window display box. The Dark Spud includes The Dark Knight armor, cape, cowl and batarang. The classic Hasbro Mr. Potato Head comes in Batman's suit from the Dark Knight Rises movie! Limited edition!The preorder sale price WILL NOT LAST and is for those who take swift and decisive action! All info/images subject to manufacturer's change. Tentative release date is actually July, but we anticipate a manufacturer delay in release.